Niger have appointed Gernot Rohr as their new national team coach. The German will take the reins for the first time on Sunday when Niger travel to Guinea for the first-leg of their final-round qualifier for the 2013 Africa Cup of Nations. 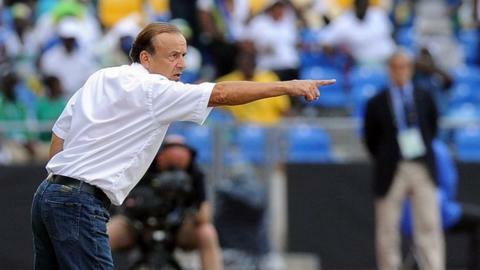 Rohr, who replaces Frenchman Rolland Courbis, coached co-hosts Gabon at the Nations Cup finals earlier this year. But after Gabon were eliminated in the quarter-finals of the tournament, Rohr's contract was not renewed. The 59-year-old Rohr played at Bayern Munich and Girondins Bordeaux, and then coached Bordeaux when they lost to Bayern in the 1996 Uefa Cup final. His other past managerial jobs include French club Nantes and Nice, Young Boys Berne in Switzerland and the Tunisian club Etoile du Sahel. The Niger Football Federation has not released any details of his contract terms.